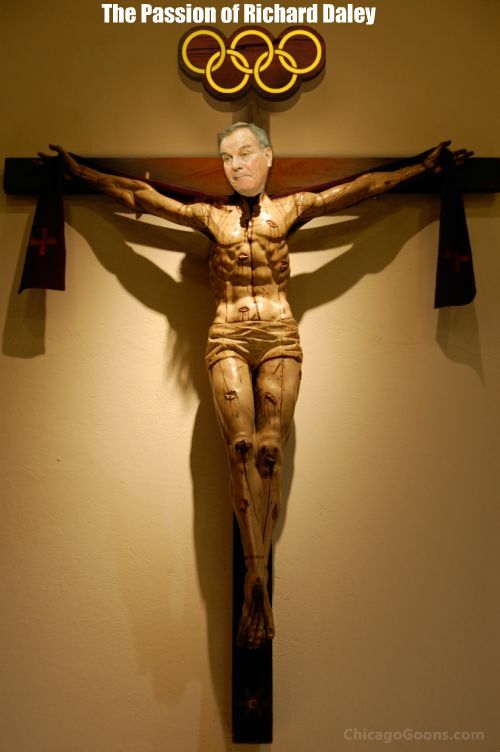 This is a vision of Mayor Daley and his insane desire to be the God Almighty of the Olympic Games. For some reason, Daley thought he could crap the world with is bully tactics, just like he does in Chicago. I always hear about Daley and his passion, fight for what you believe in, he bellows like a big airbag. Daley has a problem because he has been put in his place again by everyone outside the Chicagoland area. They do not rely on his illegal contracts and bending the laws, his arm-twisting is stopped at the door. I find it beyond belief Daley is worried about abortion rights at this time, when his credibility and respect is tanking. I wonder what fool in his Administration told him to rant about this new topic. 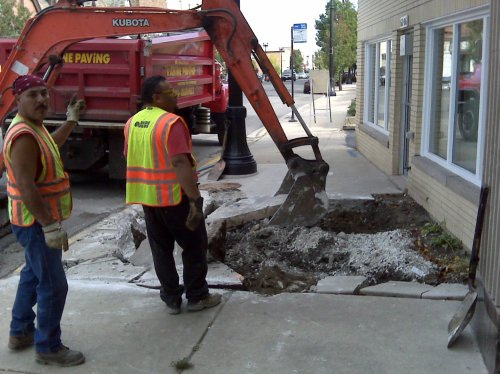 Daley cannot control all the contract favors and keep Chicago City Workers gainfully employed. Chicago is in a financial mess, Daley is at the helm. When trouble happens, people look for answers; Daley is not the go to guy. I have finally met someone to partner with on getting graphics which will give Jack Higgins a run for his money. Now that is a great and mighty task! We are also fixing the sound in our last video posts that was caused in the studio. Did Mayor Daley break into Emery Joe Yost&apos;s Clout Song Video? 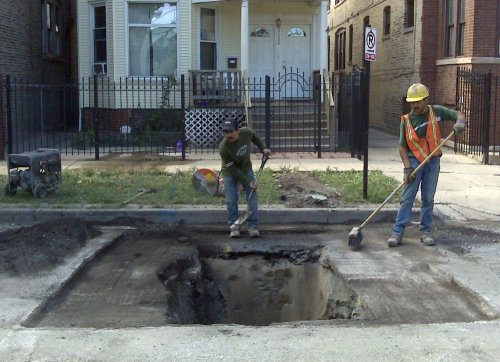 Now the whole story regarding George Prado and the Department of Water Management; Many City of Chicago workers knew what was going down in the Department of Water Management in the North District. George drove a nice Mercedes Benz two door sports car and had prime parking right by the fence in the Wabansia yard. (3822 West Wabansia in Chicago) George had a really nice job of driving the compressor truck, a clout job. This was a job so nice, George was one of the best dressed in the department. Several of the workers were on heroin and everyone knew it. The department gave preferential treatment to these workers, they worked in the yard, the dock, or investigator shift. Some of these guys also move furniture and completed personal errands on city time for the bosses. One of the guys sported a huge chrome gun, showed it to everyone, and nothing was done. Anyone who knew the system knew who gave these guys great treatment. Imagine making full engineer&apos;s pay with a do nothing job. Maybe someday the investigators will question George Prado and get an answer on how he could be two places at once. This is a case of looking away from the people that were responsible during his employment with the City of Chicago. This is a case of bosses allowing corruption, Heroin deals, and payroll fraud. Same guys that got away with HIred Trucks. It went on for years at work and the old Inspector General knew nothing? George Prado was a dago wannabe, just another guy that knows more than he told. But, these were the guys that were taken care of, Chicago Style.